La Maison de Pierre et Valérie is ideally situated in the heart of historic Honfleur, 400 meters away along the picturesque streets winding down to the Place Sainte-Catherine. You are only five minutes away from it all and no need for the car. The Sainte-Catherine area, built at the same time as the town ramparts, is where La Maison de Pierre et Valérie**** now stands. This is a maritime neighbourhood where seafarers have left their mark. Their old half-timbered houses are with us still today. As described by the Hachette Tourisme guide book: "With its maze of paved streets, its half-timbered houses and picturesque church, Sainte-Catherine seems to come straight out of a pirate film or a cape and sword saga. Even though pirates and master mariners are not often seen on Honfleur's streets nowadays, the charm is still here to stay." 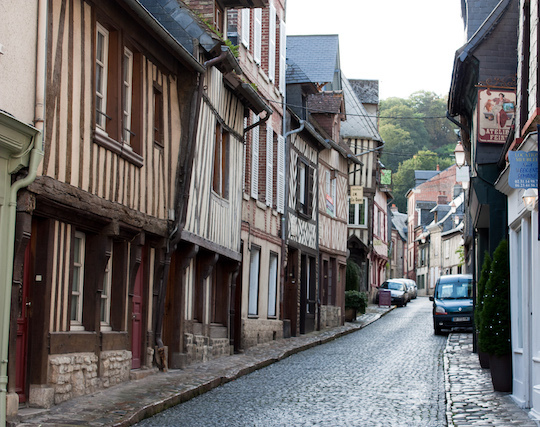 The maze of paved streets, the half-timbered houses and the picturesque church . Honfleur. La rue du Puits The Sainte-Catherine church, constructed all in wood by the town's master shipyard builders after the Hundred Year's War. Honfleur Sainte-Catherine The pretty paved streets and half-timbered houses along the Rue du Puits, between the Place du Puits and the Place Sainte-Catherine. 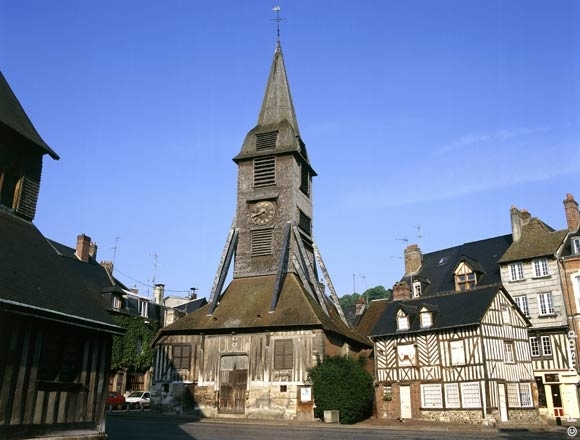 At the end of the rue du Puits is Sainte Catherine's Church, built in the 15th century to replace an older church destroyed during the Hundred Year's War. It was constructed by the town's inhabitants once the English had left. They did not have much money so they used wood from the Touques forest and their shipbuilding know-how. Classified as a historic monument in 1879, it is the largest church in France to be made of wood. With its inverted hull-shaped naves and separate bell tower (so as not to weaken the timber framework) it is absolutely unique! Be sure not to miss the Saturday-morning street market on the Place Sainte-Catherine . To get to La Maison de Pierre et Valérie by car, the simplest route is via Equemauville (you get to see a beautiful view of Honfleur), take the Route de la Croix Rouge which gets you straight to the Place without having to go through the centre of Honfleur. This is the best route on Saturdays (market day). 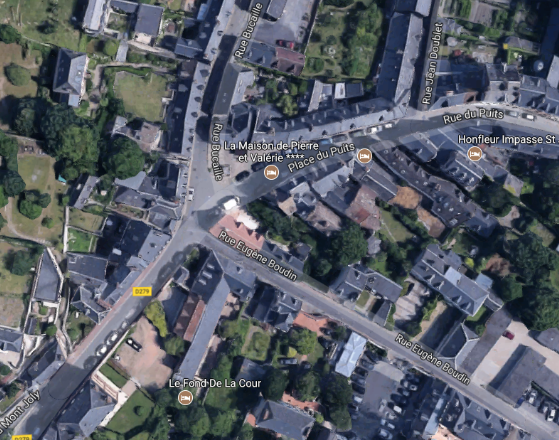 By car: if you arrive via Honfleur, take the rue Eugène Boudin. If you are coming from Equemauville, go down the D279 (Charrière de la Croix-rouge). By bus: Direct bus line Ouibus and Starshipper Paris Deauville, then continue with Bus Verts du Calvados line n°20. Where to park your car. Park where the map is marked in green. You will surely find free space. The house does not own a parking spot, but there are many possibilities in the streets around. Have no fear, the neighbourhood is very quiet and parking is free of charge. The best plan is to stop off on the Place du Puits to unload your luggage, then to park your car on the street which goes up to Equemauville (La charrière de la Croix-rouge) where parking is free (marked in green on the map). You will be sure to find a space. During the holiday season, you may have to walk a bit, but isn't that what holidays are for?